Doerfel, Joel. 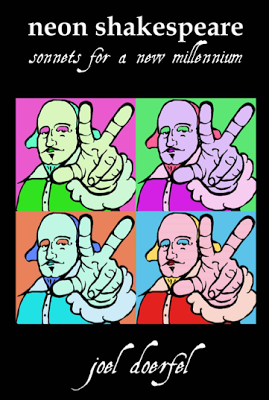 Neon Shakespeare: Sonnets for a New Millennium.. N.p. : Long Yes Press, 2013. Some time ago, the author of these sonnets sent me a preview copy, asking if I would be interested in reading and reviewing the work. 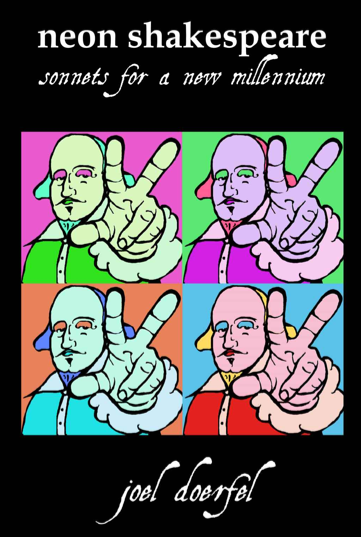 Initially, I was, as you would be, worried that each sonnet would be nothing more—or not much more—than a modernized version of the corresponding Shakespeare sonnet. I was pleasantly surprised—and even (I'll admit it) occasionally shocked—when I read the work. In this book, Doerfel doesn't try to translate Shakespeare's sonnets into a modern vernacular. Nor does he produce something cheesy like an answering sonnet from the one addressed (the Dark Lady, the Rival Poet, et cetera). Instead, the complexity of the work lies in an exchange between each sonnet and its pair. Since each of my sonnets is a conceptual response to its Shakespearean counterpart, readers are encouraged to read Shakespeare’s sonnet first, followed by my response. My responses range from parody to commentary to elaboration to dumbfounded silence. Half the fun is unraveling the logic of this call-response. And it is fun. I found these thoughtful, playful, and clever. And—I should mention it—I occasionally found them to use coarse language. In an attempt to recreate the layout of the book—where Shakespeare's sonnet on the left faces Doerfel's sonnet on the right of each page spread—I'm putting three of my favorite call-and-response sets below, with Shakespeare's flush with the left margin and Doerfel's indented. I hope you enjoy them as much as I do! she drinks her wine. he drinks his gatorade. she hasn’t had her cup of coffee yet. he just quit smoking & she just got laid. she’s on the rag. he’s started working out. such liturgies pervade their daily lives. their holiest communions are mundane. these habit-casuistries decide their days. busy with her soul & church & kids. he makes his life into a work of art. she follows jesus. he’s an agnostic . . .
. . . he lives embodied & refines his tastes. she pines for her eternal resting-place. when "pro," i'm -scribed by all my -creations. when "circum," -vented by my -locutors. when "contra," i am -vened by my -dictions. when "meta," all my -physics become -phors. when "con," my -cepts & -clusions all seem -trived. when "be," my -havior always -lies my -liefs. when "a," -gnostics are -mused that i'm still -live. my -stincts, -tuitions, -klings, & -telligence. as -, -gnorant, become my -ambs & -deals. or think myself in your objective case. so doting eyes & minds become your mirrors. you wear their stares. their smiles are where you hide. a coin, an accolade, a ghost, a dream. your prowess and your praise fail to impress. go elsewhere with your frail false-consciousness.